Formation of erbium oxide: 4 Er + 3 O2 → 2 Er2O3  Erbium oxide is insoluble in water and soluble in mineral acids. Er2O3 readily absorb moisture and carbon dioxide from the atmosphere. It can react with acids to form the corresponding erbium(III) salts. 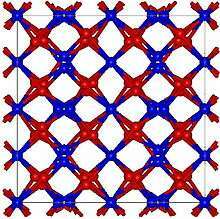 One interesting property of erbium oxides is their ability to up convert energy. Energy up conversion takes place when infrared or visible radiation, low energy light, is converted to ultraviolet or violet radiation higher energy light via multiple transfer or absorption of energy. Erbium oxide nanoparticles also possess photoluminescence properties. Erbium oxide nanoparticles can be formed by applying ultrasound (20 kHz, 29 W·cm−2) in the presence of multiwall carbon nanotubes. The erbium oxide nanoparticles that have been successfully made by employing ultrasound are erbium carboxioxide, hexagonal and spherical geometry erbium oxide. Each ultrasonically formed erbium oxide is photoluminescence in the visible region of the electromagnetic spectrum under excitation of 379 nm in water. Hexagonal erbium oxide photoluminescence is long lived and allows higher energy transitions (4S3/2 - 4I15/2). Spherical erbium oxide does not experience 4S3/2 - 4I15/2 energy transitions. The applications of Er2O3 are varied due to their electrical, optical and photoluminescence properties. Nanoscale materials doped with Er+3 are of much interest because they have special particle-size-dependent optical and electrical properties. Erbium oxide doped nanoparticle materials can be dispersed in glass or plastic for display purposes, such as display monitors. The spectroscopy of Er+3 electronic transitions in host crystals lattices of nanoparticles combined with ultrasonically formed geometries in aqueous solution of carbon nanotubes is of great interest for synthesis of photoluminescence nanoparticles in ‘green’ chemistry. Erbium oxide is among the most important rare earth metals used in biomedicine. The photoluminescence property of erbium oxide nanoparticles on carbon nanotubes makes them useful in biomedical applications. For example, erbium oxide nanoparticles can be surface modified for distribution into aqueous and non-aqueous media for bioimaging. Erbium oxides are also used as gate dielectrics in semi conductor devices since it has a high dielectric constant (10-14) and a large band gap. Erbium is sometimes used as a coloring for glasses and erbium oxide can also be used as a burnable neutron poison for nuclear fuel. ↑ Lide, David R. (1998). Handbook of Chemistry and Physics (87 ed.). Boca Raton, FL: CRC Press. pp. 4–57. ISBN 0-8493-0594-2. ↑ Aaron John Ihde (1984). The development of modern chemistry. Courier Dover Publications. pp. 378–379. ISBN 0-486-64235-6. 1 2 Singh, M.P; C.S Thakur; K Shalini; N Bhat; S.A Shivashankar (3 February 2003). "Structural and electrical characterization of erbium oxide films grown on Si(100) by low-pressure metalorganic chemical vapor deposition". Applied Physics Letters. 83 (14): 2889. doi:10.1063/1.1616653. Retrieved April 17, 2012. ↑ "Erbium Biological Action". Retrieved April 9, 2012. ↑ Emsley, John (2001). "Erbium" Nature's Building Blocks: An A-Z Guide to Elements. Oxford, England, Uk: Oxford University Press. pp. 136–139. ISBN 0-19-850340-7. ↑ "Rare-earth-doped nanoparticles prove illuminating". SPIE. Retrieved April 10, 2012. 1 2 Radziuk, Darya; Andre Skirtach; Andre Geßner; Michael U. Kumke; Wei Zhang; Helmuth M€ohwald; Dmitry Shchukin (24 October 2011). "Ultrasonic Approach for Formation of Erbium Oxide Nanoparticles with Variable Geometries". Langmuir. 27: 14472–14480. doi:10.1021/la203622u. Retrieved April 10, 2012. 1 2 Richard, Scheps (12 February 1996). "Upconversion laser processes". Progress in Quantum Electronics. 20: 271–358. doi:10.1016/0079-6727(95)00007-0. Retrieved April 14, 2012. ↑ Andre, Skirtach; Almudena Javier; Oliver Kref; Karen Kohler; Alicia Alberola; Helmuth Mohwald; Wolfgang Parak; Gleb Sukhorukov (2006). "Laser-Induced Release of Encapsulated Materials inside Living Cells" (PDF). Angew. Chem. Int. Ed. 38: 4612–4617. Retrieved April 15, 2012. ↑ Lide, David (1998). Handbook of Chemistry and Physics. Boca, Raton Fl: CRC Press. pp. 4–57. ISBN 0849305942.